Sean Hogan of Colorado State University - Global Campus will show tips, tools, and techniques to customize the look of your LibGuides. 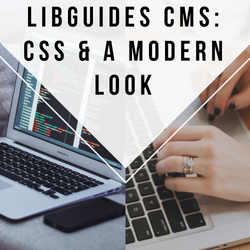 During a wide array of projects, culminating in a recent website redesign, CSU - Global Campus developed a number of procedures to alter the look of their LibGuides CMS instance drastically. Starting with the design framework and the basics of using the native LibGuides Framework, Bootstrap 3, Sean will show participants how to use the inspect tool to locate and modify code to achieve the look they desire, even if they have little to no CSS knowledge. Participants will leave with the tools to change the way their personal or institutional LibGuides look, right away.